The May 13, 2002 issue of US News & World Report proclaimed "Yoga booms in popularity as a way to heighten flexibility, improve breathing, and gain sanity." • In March 2006, Runner's World magazine put the figure at 16.5 million. • In 2012, it was estimated that 20 million participated in yoga. • The 2016 "Yoga In America" study revealed that 36 million Americans participate in yoga. Yoga enthusiasts participate in this type of exercise in hopes of reaping physical benefits like improved muscle tone and strength, better balance and greater flexibility. But does it actually produce those benefits? The origins of yoga can be traced all the way back to 2250 BC when the Harrapan civilization in Northern India began to develop postures and breathing-control techniques that they hoped would enable them to enter an altered consciousness and access the spirit world. Yoga was brought to America in 1893 by Master Vivekananda. There are many types of yoga. Two of the more popular styles are Hatha yoga and Ashtanga yoga, more commonly known as "Power" yoga. Regardless of the type, all forms consist of a series of sustained poses known as "asanas." Power yoga includes many postures that develop strength in the legs, back, and abdominals, as well as weight-bearing poses that build upper-body strength. When Sun Salutations are included they are usually repeated several times as a warm-up, then repeated throughout the class. Various poses are held for several breaths in between these repetitions. • Ananda yoga: This type of yoga is more gentle. 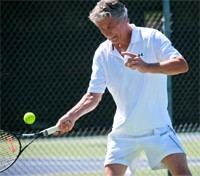 It is an inward-focused style that is not as athletic or aerobic as other styles. • Ashtanga yoga: "Power" yoga generally refers to a yoga style that is intense and vigorous. Originally intended to describe an Ashtanga yoga class, this term is now used more loosely. Any yoga class that is a modification of Ashtanga yoga or includes demanding poses and an intermittent flow of movement might be identified as a “power yoga” class. These classes are designed to create a balance of strength, flexibility, and stamina. • Bikram yoga: Bikram Choudhury founded the Yoga College of India in Beverly Hills in 1974. He is one of the pre-eminent Hatha Yoga Masters living today. His physical fitness Guru was Bishnu Charan Ghosh, brother of Yogananda, founder of The Self-Realization Fellowship. Bikram is an India National Yoga Champion and has been named most knowledgeable Hatha Yoga teacher in the world. The principle behind Bikram yoga is that the body is more flexible in a hot environment. So, Bikram yoga involves a series of 26 asanas performed in a room that may be as hot as 100 degrees. This is to warm up your whole body, and allows you to work deep into your muscles, tendons, and ligaments. • Hatha yoga: Hatha yoga is an eclectic blend of many yoga styles. This type of yoga is frequently recommended for beginners, or for people who are concerned about over-stressing their shoulders, knees, or lower back. Unlike Vinyasa yoga (see below), each pose is held motionless before moving on to the next one. Hatha yoga seeks to achieve a balance of mind, body, and spirit through specific poses (asanas) and breathing. • Iyengar yoga: This style of yoga focuses on precise alignments of each pose, and uses props such as belts and blocks to achieve ideal alignment. • Kundalini yoga: Kundalini yoga is a complete science that combines breathing (pranayama), chanting (mantra), exercises (Kriyas), and meditation. • Vinyasa yoga: Vinyasa yoga is also considered a "power" yoga style. In this style, there is minimal hesitation between each pose, producing a continuously flowing type of movement. Because it is more physically demanding, it is recommended for intermediate and advanced students. Some have grouped the various styles of yoga into 2 general categories: yin types and yang types. The more athletic and physically demanding styles of yoga are referred to as the yang type. Examples here include Ashtanga yoga, Vinyasa yoga, and any class called "power" yoga. The slower and more gentle styles are referred to as the yin types. For more information on this type, see www.YinYoga.com, a web site created by yoga practitioner Bernie Clark. The 3rd edition of her book "Beth Shaw's YogaFit®" (pictured to the right) was published in 2016. Potential physical benefits of yoga include increased strength and endurance, improved balance, and better flexibility. However, despite yoga's long history and the large number of faithful participants, limited research has been conducted regarding its physical benefits. A small study from the University of California at Davis (Tran MD, et al. 2001) showed that 2 Hatha yoga sessions per week for 8 weeks improved a variety of fitness parameters. Each session consisted of 10 minutes of pranayamas (breath-control exercises), 15 minutes of dynamic warm-up exercise, 50 minutes of asanas (yoga postures), and 10 minutes of relaxation in savasana (corpse pose). Another study of Hatha yoga comes from the University of Wisconsin. Researchers Dawn Boehde, a certified yoga instructor, and John Porcari, PhD, from the University's Human Performance Laboratory recruited 34 healthy women (average age: 33) for the study. All of the subjects were sedentary and were not involved in a regular exercise program or yoga training for six months prior to the study. The test subjects were divided into a yoga group and a non-yoga control group. The yoga group participated in 55-minute Hatha yoga classes, three days a week. During the eight-week study period each participant completed an average of about 21 classes. All of the yoga classes were taught by Boehde. Each started with five minutes of relaxation and yoga breathing (pranayama), followed by 10 minutes of warmup exercises including sun salutations, 35 minutes of yoga postures (asanas), and, finally, five minutes of relaxation and yoga breathing in the corpse pose (savasana). The non-yoga group was prohibited from participating in any form of exercise. • Balance: The yoga group experienced a 17-second increase in their one-legged stand time and a modest boost in their functional reach scores. Besides the obvious improvements yielded by simply practicing the variety of one-legged moves that are common in Hatha yoga, researchers point to increased proprioception and strengthening of the muscle in the ankles and legs as part of the reason for the better balance scores. • Flexibility: After eight weeks, the average flexibility of the yoga group improved by 13-35% and the gains were significantly greater than the non-yoga group, especially in shoulder and trunk flexibility, and ankle range of motion. “We saw very nice changes in flexibility of the entire body, the shoulder girdle, twisting, bending, reaching, good low-back flexibility,” says Porcari. • Muscular strength and muscular endurance: Similarly, muscular strength and endurance also improved in the yoga group. In particular, chest and abdominal strength and endurance was increased significantly, enabling the yoga group to perform an average of six more push-ups and 14 more curl-ups following the study period. “For the average person who doesn't have a fitness program, this study shows what would happen if you did eight weeks of Hatha yoga, 3 times per week,” explains Boehde. However, yoga doesn't improve aerobic fitness very much. The UC Davis researchers (Tran MD, et al. 2001) found that VO2max increased by only 6-7% and there was no significant change in VO2max or maximal heart rate in the U. Wisconsin study. "You get changes in strength and muscular endurance, flexibility, balance -- all those types of things -- but in order to improve aerobic capacity you really have to be working in the aerobic training zone," says Porcari. "Based on what we found, the intensity just wasn't there." As a companion to the Hatha yoga study summarized above, Porcari and Stefanie Spilde analyzed the exercise intensity and caloric expenditure of two types of yoga. For this study, researchers recruited 15 participants, with at least an intermediate level of yoga experience, and monitored their exercise intensity as they participated in two 50-minute yoga sessions (one Hatha yoga, one Power yoga) following a videotaped routine for consistency. Researchers found that a 50-minute session of Hatha yoga burns 144 calories, equivalent to a slow walk, and provides no substantial aerobic benefit. Power yoga burns about 237 calories in 50 minutes and boosts heart rates to 62 percent of heart rate max (HRmax), providing just a mild aerobic workout. Another study showed that 30 minutes of Hatha yoga produced an average heart rate of only 105 beats per minute in middle-aged women. The energy costs of this yoga session were about half that of walking on a treadmill at 3.5 mph and only about 10% greater than sitting in a chair. The authors concluded that "Hatha yoga may have little, if any, cardiovascular benefit" (Clay CC, et al. 2005). "Yoga is a great muscular workout and you certainly sweat, but it's not an aerobic workout," says John Porcari, PhD. Nevertheless, yoga is a great addition to the training program for runners due to its other benefits. This was summarized in the March 2006 issue of Runner's World magazine. Despite the widespread popularity of yoga, and, how long it has been practiced, there is surprisingly little research validating its health benefits. One of the problems is that there are many different styles of yoga. Researchers from Long Island University in Brooklyn, NY evaluated the physiologic responses to a single 1-hr Hatha yoga session and concluded that it wasn't challenging enough to match current exercise recommendations for maintaining optimum health. They equated a session of Hatha yoga to slow walking on a level surface (Hagins M, et al. 2007). • Yoga for Arthritis: It's well known that yoga can improve flexibility in various joints. 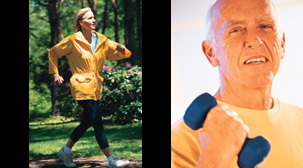 But, is it beneficial in patients with documented arthritis? Some limited research does suggest that it is (Garfinkel M, et al. 2000). • Yoga for Back Pain: A study from the University of Washington in Seattle showed that one 75-minute viniyoga class per week for 12 weeks led to more improvement than conventional therapeutic exercise in patients with chronic back pain. Each class included an initial and final breathing exercise, 5 to 12 postures, and guided deep relaxation. Most postures were not held but were repeated 3 or 6 times (Sherman KJ, et al. 2005). • Yoga for Hypertension: Yoga was shown to have beneficial effects on blood pressure as early as 1973 (Patel CH, 1973). More recently, researcher Debbie Cohen, MD, at the University of Pennsylvania has been studying the effects of yoga in patients with hypertension for several years. She is the lead investigator of the "Lifestyle Modification and Blood Pressure Study." So far, they have found that a 12-week yoga program lowered BP in patients with pre-hypertension or stage-1 hypertension better than sodium restriction and walking (Cohen DL, et al. 2013). A separate study out of New Delhi, India, revealed that systolic BP decreased by 5 points after just 10 days of yoga in overweight and obese men (Sarvottam K, et al. 2012). • Yoga Reduces Stress: Several studies show that yoga can lower circulating levels of stress hormones (Kiecolt-Glaser JK, et al. 2010) (Yadav RK, et al. 2012). However, whether yoga makes people "feel" less stressed has been variable. • Yoga and Weight Loss: One study of overweight and obese men revealed that a "yoga-based lifestyle intervention" led to a 4.2-lb weight loss after only 10 days (Sarvottam K, et al. 2012). • Yoga Modifies Cardiovascular Disease Risk Factors: Several studies show that yoga can reduce some of the risk factors for cardiovascular disease. However, what really matters is if yoga reduces clinical "events" (ie., outcomes). So far, the jury is still out on that question (Lau HL, et al. 2012). Although yoga is a low-impact exercise, it is not without risks. Poses such as the plank, half moon, boat, camel and revolved triangle improve strength because they require you to support your upper body. However, some of these postures have the potential for straining the shoulder, knee, or lower back. For example, a frequently performed upper-body pose in a power yoga class is the yoga-style push up, Chaturanga Dandasana. This movement requires a lot of strength in the upper arms, shoulders, and lower back. Power yoga classes present a higher cardiovascular risk than other forms of yoga. Therefore, those who have existing cardiovascular disease, hypertension, type 2 diabetes, or who are significantly overweight should probably avoid these classes, at least, when first starting out. Participants should be physically fit before performing power yoga. "Hatha yoga will improve your strength, but you'll get much stronger, more quickly, by simply lifting weights," Pocari says. As for a cardiovascular workout, yoga isn't the answer for that either. Researchers warn that efforts to boost the cardio benefits of yoga will only result in reduced flexibility and balance benefits. "It's always a tradeoff," says Porcari. "Yoga was designed for relaxation, primarily. The more aerobic you make yoga, the less improvements you'll see in those other areas." That said, some of these "hybrid" forms of yoga do seem appealing. For example, there are classes that combine yoga with Pilates (eg., "Pilates mat class", "Yogilates", etc.). "Iron Yoga" is yet another style that Anthony Carillo promotes in his book and DVD. Nevertheless, Hatha yoga is still an excellent addition to any fitness routine, particularly because it targets aspects of fitness such as flexibility, balance, and relaxation that are often skipped or overlooked. Newcomers will benefit from taking a beginner's yoga course to become familiar with a basic repertoire of asanas before joining a power yoga class. In power yoga, proper alignment and good body mechanics are crucial. A preparatory class in which the poses and sequences are broken down is recommended. People with back problems or joint issues should approach this style cautiously. • Postures that require a sustained contraction of the long, thin muscles of the back should not be held for longer than 5-6 seconds. Instead, build up the strength and endurance of these torso muscles by doing more reps, NOT by holding each position as long as you can. • Power yoga classes present a higher cardiovascular risk than other forms of yoga. Power yoga is not recommended for people with hypertension or heart problems, type 2 diabetes, or who are significantly overweight. Participants should be physically fit before participating in power yoga. 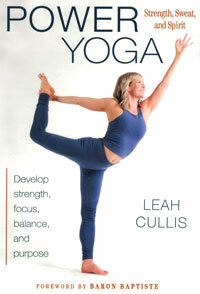 In addition to Beth Shaw's book YogaFit (see above), Leah Cullis published "Power Yoga: Strength, Sweat, and Spirit." • Yoga for men: Yoga is not just for women. Check out the books Yoga For Regular Guys: The Best Damn Workout on the Planet! by former wrestler Diamond Dallas Page, and Real Men Do Yoga by John Capouya. In New York City, check out: Bode NYC: BodeNYC.com. 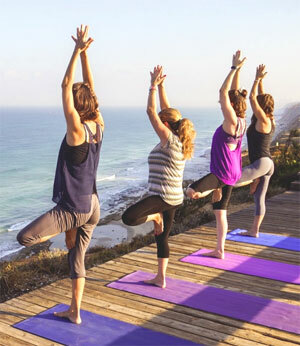 • Yoga on your computer: Yoga Today (www.YogaToday.com) offers a streaming video of a yoga class conducted outdoors in Jackson Hole, Wyoming. You can't perform yoga effectively without a good mat. 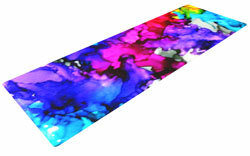 Check out these cool designs: yoga mats.